If you have a Bosch dishwasher I urge you click on this link and check to see if your dishwasher could be affected. 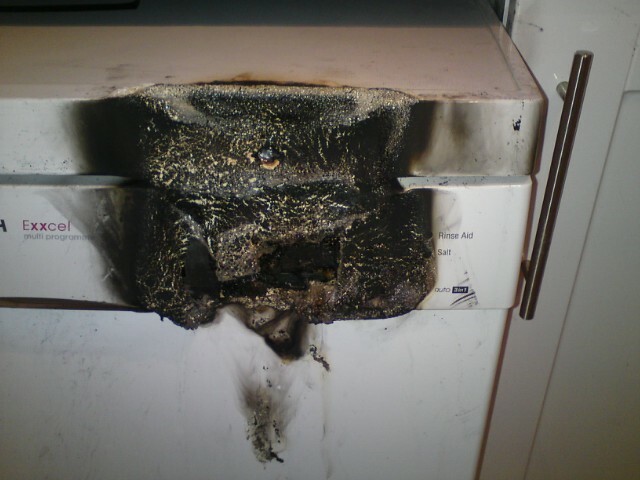 My friend only found out in the middle of the night when her smoke alarm went off – she then found flames pouring out of her dishwasher. As you can see from the above picture, they are very lucky they had a smoke alarm. This is a known fault which means that any of the dishwashers listed here could potentially be a fire risk. Please check. Also – please make sure that you have a smoke alarm and that it has a working battery. How awful – thank goodness she had a fire alarm – just proves the importance of having them in the house. Our dishwasher also caught fire. Bosch were recalling these in the United States two years ago yet failed to notify UK consumers. I hope there wasn’t too much damage. It certainly looks as though Bosch could have done more to raise awareness of the issue.